way through the 1986 season after he was released by Ottawa. When the Hamilton Tiger-Cats met the Toronto Argonauts in the CFL Eastern Conference final back in 2013, it was the first time the two teams met in the eastern final since 1986. That game in 1986 was memorable for several reasons. It in fact was not one game but two, the last time the league used the two-game, total-point format. It also symbolized the last time Julius Caesar Watts played in the CFL, ending six eventful years. When we left you, J.C.Watts had just about engineered one of the greatest upsets in Grey Cup history, before falling just three points short in the 1981 game. Watts was named offensive most valuable player of that Grey Cup, and the future looked bright. But, as the 1982 season opened, J.C. Watts was not on the field. In fact, he did not play at all in 1982. He wanted his contract re-worked, including payment in U.S. dollars. He threatened to sit out the year, unless his contract was re-done. Ottawa did not budge. Because he was under contract, it meant Watts would play in Ottawa or not at all. So J.C. Watts did not play football at all that year. While he was gone, Ottawa finished with a record of 5-11 for the second straight season. Chris Isaac had taken over at quarterback, with Jordan Case and Kevin Starkey also seeing playing time. Isaac would throw for 3,408 yards and 18 touchdowns to win the CFL rookie of the year, beating out Mervyn Fernandez of the B.C. Lions. The Riders finished third in the East Division, setting up a re-match of the 1981 East Division Final against the Tiger Cats on Nov. 14, 1982 in Hamilton. Ottawa won that game 30-20 to advance to the East Final against Toronto on Nov. 21. It was Ottawa’s last ever win in the playoffs. The Argonauts would blow out the Rough Riders 44-7, advancing to the Grey Cup, which they lost to Edmonton. It was the last of the Eskimos’ five straight championships. Everything was ironed out for the 1983 season, as J.C. Watts re-joined the Rough Riders, who were a much different team now. They were deeper at receiver with the addition of Tyrone Gray from B.C. and Dave Newman from Toronto, to go with the reliable Pat Stoqua. They also had one of the league’s best running backs in Alvin “Skip” Walker. Watts would lead the Rough Riders to an 8-8 record, the first year they had been .500 or better since 1979, which was also their last ever winning season. Watts had decent numbers, completing 175 of 358 passes for 3,089 yards, 18 touchdowns and 20 interceptions. He also rushed 76 times for 552 yards and five touchdowns. The Rough Riders finished second in the East Division and hosted the Hamilton Tiger Cats, who avenged two previous playoff defeats and beat Ottawa by a score of 33-31. It was the last playoff game Ottawa ever hosted. Watts played well in defeat, throwing for 303 yards and two touchdowns with no interceptions. The 1984 season saw Ottawa fall to 4-12, missing the playoffs for the first time since 1970. Watts had another decent season though, completing 189 of 360 passes for 3,052 yards, 21 touchdowns and 23 interceptions. He also rushed 61 times for 357 yards and one touchdown. Ottawa rebounded in 1985, with a better season. They finished 7-9, good enough for third in the East and qualifying for the playoffs. They lost in the East Division Semi-final to the Montreal Concordes by a score of 30-20, signalling the last playoff game J.C. Watts ever played for the Rough Riders. He completed 236 of 439 passes for 2,975 yards, 12 touchdowns and 25 interceptions. He rushed 106 times for 710 yards and one touchdown, making him the team’s leading rusher. 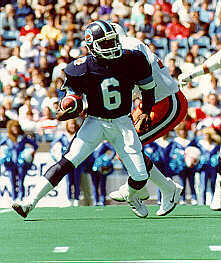 The 1986 season opened with J.C. Watts again starting at quarterback for the Ottawa Rough Riders. He would complete 66 of 127 passes for 864 yards, seven touchdowns and nine interceptions. He also rushed 31 times for 206 yards and a touchdown. Ottawa started with two wins before dropping six straight games to fall to the bottom of the East. Deemed as ineffective, J.C. Watts was released by Ottawa and replaced with Tom Burgess. He was picked up by the Toronto Argonauts, and reunited with coach Bob O’Billovich, who had been an assistant in Ottawa during that magical 1981 season. Watts made an impact early. Initially acquired to back up Condredge Holloway, he came off the bench on Sunday, Sept. 7 after Holloway was injured. Watts proceeded to rally the Argos from 17 points down to defeat Hamilton by a score of 25-23. Again in Week 19, on Sunday, Nov. 2, he rallied his team late. Playing Montreal, the Argos scored two last-minute touchdowns 39 seconds apart to pull out a 25-21 victory. Watts ran the first one in from six yards out, then threw a 13-yard pass to Paul Pearson. By season’s end, Watts had led Toronto to a 6-5 record over the remainder of the year, to finish 10-8 overall, good enough for first place in the East Division. He completed 108 of 182 passes for 1,477 yards, five touchdowns and five interceptions. He rushed for 35 times for 227 yards and four touchdowns. The CFL, sensing the imbalance between West and East, changed the playoff format that season. Instead of the top three teams in each division making the playoffs, the top two automatically qualified. If the fourth-place team in one division had a better record than the third-place team in the other division, the fourth-place team made the playoffs. Unlike the system today, where that team crosses over, back in 1986 the team stayed in their own division. That meant Edmonton played Calgary and B.C. played Winnipeg in the West, with the winners playing for the West Division title. In the East, Toronto played Hamilton in a two-game, total-point East Final with the winner going to the Grey Cup. It was the first two-game, total point playoff since 1972. The first game was in Hamilton on Nov. 16, and the Argonauts beat Hamilton by a score of 31-17, as Watts ran for two touchdowns and threw for another. Game 2 was one week later, on Nov. 23, in Toronto, and Hamilton had to win by at least 15 points. Hamilton evened the aggregate score at 49 points each on the last play of the third quarter. In the final 15 minutes, Hamilton kicked a field goal, Toronto responded with a touchdown, but Hamilton scored last as quarterback Mike Kerrigan hit Ron Ingram for a six-yard touchdown with 1:42 to play. There would be no last-minute heroics by J.C. Watts as the Tiger Cats won by a score of 42-25 to win the series by a total score of 59-56. Watts finished the two games with four passing touchdowns and 12 rushes for an average of 7.3 yards. He would retire at the end of that season and never play professional football again. He finished as the third leading rushing quarterback of the 1980s, with 2,312 yards on 346 carries for an average of 6.7 yards, only trailing leader Ken Hobart who had 4,632 yards on 383 carries for a 7.6-yard average, and Matt Dunigan who had 3,271 yards on 542 carries for a six-yard average. The last time we saw J.C. Watts at a CFL game was in 1995, when the Birmingham Barracudas played the Baltimore Stallions in an exhibition game at the Orange Bowl in Miami. It was set to be a precursor for CFL expansion into Miami, and the start of a team called the Manatees. Watts was there because proceeds from the game were for the Oklahoma City Relief Fund. Watts, now a U.S. Congressman representing Oklahoma, was there to receive the cheque. J.C. Watts would go on to serve as a Republican Congressman for the state of Oklahoma. At one point, he was in such high esteem, he gave the response to President Bill Clinton’s State of the Union address. It was always a bit surreal to hear Congressman J.C. Watts, because he will always be that scrambling quarterback to me. If there is one word that describes J.C. Watts it’s: electric. You never knew what he was going to do when he had the ball. His career stats reveal almost as many interceptions as touchdowns, but also those huge rushing totals. Third highest in the 1980s, and he played less than half the decade. He truly was one of the most unique players to come north in some time. It is sad that he went quietly into the night without a send-off, or a retirement party or anything. He may not have ended with a bang, as I think all players would like to, but he sure gave us a lot of memories along the way. Thanks for the memories J.C.